… and people are next. Sounds pretty creepy, but it seems there’s some actual utility in the process to aid in vitro fertilization right now. And it can’t happen a day too soon. Allowing theocrats to hijack scientific and medical research only puts the United States that much more under the gun of losing dominance in fields that will — will, not might — have a major influence on human life and the global marketplace in the very near future. Cold Spring Harbor, NY – Against a backdrop of some of the world’s most sophisticated biological research labs, Rep. Steve Israel (D-Huntington) this morning issued a challenge to his colleagues in Congress: immediately upon their return from summer recess, he urged, they should pass legislation that would reverse a recent Federal court decision that has brought embryonic stem cell research in the U.S. to a screeching halt. Rep. Israel was seconded in his plea by Dr. Bruce Stillman, a renowned cancer researcher and President of Cold Spring Harbor Laboratory, which hosted the Congressman’s announcement to the press this morning. Also lending vocal support was Brooke Ellison, a stem cell research advocate and instructor at Stony Brook University, who, since a car accident in 1990, has been a quadriplegic. Rep. Israel said the Aug. 23 decision by Chief Judge Royce C. Lamberth of the Federal District Court for the District of Columbia, “sets back research, sets back patients, and sets back jobs,” on Long Island and across the nation. The decision, which prevents federally funded research from being conducted on any embryonic stem cells derived from human embryos, “has not only rolled back the Obama policy on stem cells, but has actually rolled back the Bush policy,” Israel noted. The Congressman said he regards the legal appeals process too slow, given the gravity of the matter. “I don’t think we should wait for an appeal,” he said. “We’ve got to act, and act fast.” Congress has twice in the past decade passed bills giving the go-ahead for embryonic stem cell research. “The Judge said Congress created the policy, and only Congress can revisit it. Well, I want to take him up on that. When we return to Washington on Sept. 14, the House, as one of its first priorities, should re-pass the very legislation that it has passed twice before.” If passed by the Senate, such a bill would be almost certain to receive a presidential signature, thus ending any ambiguity about the will of Congress, Israel said. Dr. Stillman said he believed that bringing the matter before Congress once more “will not only clarify the situation,” but will provide Congress with a golden opportunity “to make a strong statement to the people of this country and to patients like Brooke Ellison, who are counting on steady progress in stem cell research.” The prior passage by Congress of two bills enabling research with embryonic stem cells is evidence of the strong public support that exists for this type of research, Stillman said. Dr. Stillman said that while most work involving stem cells at CSHL was not embryonic stem cell research, any labs in which embryonic cells are used will now be subject to the National Institutes of Health’s recent interpretation of Judge Lamberth’s ruling. He said there was still some ambiguity about whether the interpretation will hold up under inevitable challenge. But the point, Dr. Stillman emphasized, is that science cannot properly proceed and the therapeutic potential of embryonic stem cells cannot be discovered — by researchers working in America — unless research is permitted to proceed in unfettered fashion. Cold Spring Harbor Laboratory (CSHL) is a private, not-for-profit research and education institution at the forefront of efforts in molecular biology and genetics to generate knowledge that will yield better diagnostics and treatments for cancer, neurological diseases and other major causes of human suffering. For more information, visit www.cshl.edu. Nanotechnology is proving to be a key component in the fight against cancer and I’ve done a lot of blogging about the topic. Here’s another breakthrough on that front, this time targeting breast cancer with an arsenic nanoparticle. CHICAGO — You can teach an old drug new chemotherapy tricks. Northwestern University researchers took a drug therapy proven for blood cancers but ineffective against solid tumors, packaged it with nanotechnology and got it to combat an aggressive type of breast cancer prevalent in young women, particularly young African-American women. That drug is arsenic trioxide, long part of the arsenal of ancient Chinese medicine and recently adopted by Western oncologists for a type of leukemia. The cancer is triple negative breast cancer, which often doesn’t respond well to traditional chemotherapy and can’t be treated by potentially life-saving targeted therapies. Women with triple negative breast cancer have a high risk of the cancer metastasizing and poor survival rates. Prior to the new research, arsenic hadn’t been effective in solid tumors. After the drug was injected into the bloodstream, it was excreted too rapidly to work. The concentration of arsenic couldn’t be increased, because it was then too toxic. A new arsenic nanoparticle — designed to slip undetected through the bloodstream until it arrives at the tumor and delivers its poisonous cargo — solved all that. The nanoparticle, called a nanobin, was injected into mice with triple negative breast tumors. Nanobins loaded with arsenic reduced tumor growth in mice, while the non-encapsulated arsenic had no effect on tumor growth. The arsenic nanobins blocked tumor growth by causing the cancer cells to die by a process known as apoptosis. The nanobin consists of nanoparticulate arsenic trioxide encapsulated in a tiny fat vessel (a liposome) and coated with a second layer of a cloaking chemical that prolongs the life of the nanobin and prevents scavenger cells from seeing it. The nanobin technology limits the exposure of normal tissue to the toxic drug as it passes through the bloodstream. When the nanobin gets absorbed by the abnormal, leaky blood vessels of the tumor, the nanoparticles of arsenic are released and trapped inside the tumor cells. Cryns and Tom O’Halloran, director of the Chemistry of Life Processes Institute at Northwestern, are senior authors of a paper on the research, which will be published July 15 in Clinical Cancer Research and featured on the journal cover. Richard Ahn, a student in the medical scientists training program at Northwestern, is lead author. Looking ahead, the challenge now is to refine and improve the technology. “How do we make it more toxic to cancer cells and less toxic to healthy cells?” asked Cryns, also the director of SUCCEED, a Northwestern Medicine program to improve the quality of life for breast cancer survivors. Northwestern scientists are working on decorating the nanobins with antibodies that recognize markers on tumor cells to increase the drug’s uptake by the tumor. They also want to put two or more drugs into the same nanobin and deliver them together to the tumor. “Once you fine-tune this, you could use what would otherwise be a lethal or highly toxic dose of the drug, because a good deal of it will be directly released in the tumor,” O’Halloran said. The research was supported by the National Cancer Institute-funded Northwestern University Center of Cancer Nanotechnology Excellence. Northwestern has one of seven such centers in the United States. Here’s PhysOrg’s coverage of this story. News on the stem cell research front. Researchers at the Stanford University School of Medicine have developed a technique they believe will help scientists overcome a major hurdle to the use of adult stem cells for treating muscular dystrophy and other muscle-wasting disorders that accompany aging or disease: They’ve found that growing muscle stem cells on a specially developed synthetic matrix that mimics the elasticity of real muscle allows them to maintain their self-renewing properties. KINGSTON, R.I. July 8, 2010 – A new system for the controlled delivery of pharmaceutical drugs has been developed by a team of University of Rhode Island chemical engineers using nanoparticles embedded in a liposome that can be triggered by non-invasive electromagnetic fields. The discovery by URI professors Geoffrey Bothun and Arijit Bose and graduate student Yanjing Chen was published in the June issue of ACS Nano. According to Bothun, liposomes are tiny nanoscale spherical structures made of lipids that can trap different drug molecules inside them for use in delivering those drugs to targeted locations in the body. The superparamagnetic iron oxide nanoparticles the researchers embed in the shell of the liposome release the drug by making the shell leaky when heat-activated in an alternating current electromagnetic field operating at radio frequencies. Bothun said that the liposomes self-assemble because portions of the lipids are hydrophilic – they have a strong affinity for water – and others are hydrophobic – they avoid water. When he mixes lipids and nanoparticles in a solvent, adds water and evaporates off the solvent, the materials automatically assemble themselves into liposomes. The hydrophobic nanoparticles and lipids join together to form the shell of the liposome, while the water-loving drug molecules are captured inside the spherical shell. The next step in the research is to design and optimize liposome/nanoparticle assemblies that can target cancer cells or other disease-causing cells. In vitro cancer cell studies are already underway in collaboration with URI pharmacy professor Matthew Stoner. Bothun said that research on nanomedicine shows great promise, but there are still many challenges to overcome, and the targeting of appropriate cells may be the greatest challenge. Okay, for many, many years I’ve been reading about all sorts of breakthroughs, innovations and miraculous-sounding dental treatments that never really seem to pan out (remember that cavity removing painless gel anyone? ), but I couldn’t resist throwing this bit of nanotech out there. IMAGE: Dentists may use a special nano-sized film in the future to bring diseased teeth back to life rather than remove them. Scientists are reporting an advance toward the next big treatment revolution in dentistry — the era in which root canal therapy brings diseased teeth back to life, rather than leaving a “non-vital” or dead tooth in the mouth. In a report in the monthly journal ACS Nano, they describe a first-of-its-kind, nano-sized dental film that shows early promise for achieving this long-sought goal. Nadia Benkirane-Jessel and colleagues note that root canal procedures help prevent tooth loss in millions of people each year. During the procedure, a dentist removes the painful, inflamed pulp, the soft tissue inside the diseased or injured tooth that contains nerves and blood vessels. Regenerative endodontics, the development and delivery of tissues to replace diseased or damaged dental pulp, has the potential to provide a revolutionary alternative to pulp removal. The scientists are reporting development of a multilayered, nano-sized film — only 1/50,000th the thickness of a human hair — containing a substance that could help regenerate dental pulp. Previous studies show that the substance, called alpha melanocyte stimulating hormone, or alpha-MSH, has anti-inflammatory properties. The scientists showed in laboratory tests alpha-MSH combined with a widely-used polymer produced a material that fights inflammation in dental pulp fibroblasts. Fibroblasts are the main type of cell found in dental pulp. Nano-films containing alpha-MSH also increased the number of these cells. This could help revitalize damaged teeth and reduce the need for a root canal procedure, the scientists suggest. Both via KurzweilAI.net, and both as a follow-up to my previous post on killing tumors with gold nanoparticles. Oxford University chemists have encapsulated radionuclides within carbon nanotubes and set new records for highly concentrated in vivo radiodosage, while demonstrating zero leakage of isotopes to high-affinity organs, such as the thyroid. Using nanoporous silicon particles, two teams of investigators have created drug delivery vehicles capable of ferrying labile molecular therapies deep into the body, creating new opportunities for developing innovative anticancer therapies. Via KurzweilAI.net — The latest in fighting cancer with nanotechnology. Researchers at the University of California, Los Angeles, have developed a method for creating supramolecular assemblies of gold nanoparticles that function as highly efficient photothermal agents for delivery to tumors, using a laser beam to heat the nanoparticles above 374 degreesC, the temperature at which explosive microbubbles form. I’ve done a ton of blogging on cancer fighting nanotechnology, so I’m particularly pleased to read about this government initiative. Nanotech may well be the “magic bullet” researchers have been searching for in the battle against cancer. A $145-million Federal Government effort to harness the power of nanotechnology to improve the diagnosis, treatment, and prevention of cancer is producing innovations that will radically improve care for the disease. That’s the conclusion of an update on the status of the program, called the National Cancer Institute Alliance for Nanotechnology in Cancer. It appears in ACS Nano, a monthly journal published by the American Chemical Society. Piotr Grodzinski and colleagues note in the article that the alliance, launched in 2004, funds and coordinates research specifically intended to move knowledge about the small science out of laboratories and into hospitals and doctors offices in a big way. It builds on more than 50 years of advances in cancer care that although substantial, still leave cancer as the No. 1 cause of death in the United States and globally. Research has found carbon nanotubes can help the body’s immune system fight cancer. Hit this link for all my cancer-related nanotechnology blogging. New Haven, Conn.—Yale University engineers have found that the defects in carbon nanotubes cause T cell antigens to cluster in the blood and stimulate the body’s natural immune response. Their findings, which appear as the cover article of the April 20 issue of the journal Langmuir, could improve current adoptive immunotherapy, a treatment used to boost the body’s ability to fight cancer. Adoptive immunotherapy involves extracting a patient’s blood so that the number of naturally occurring T cells (a type of white blood cell) can reproduce more effectively in the laboratory. Although the body produces its own tumor-fighting T cells, they are often suppressed by the tumor and are too few to be effective. Scientists boost the production of T cells outside the body using different substances that encourage T cell antigens to cluster in high concentrations. The better these substances are at clustering T cell antigens, the greater the immune cell proliferation. Once enough T cells are produced, the blood is transferred back into the patient’s body. The Yale team had previously reported the unexpected effect that carbon nanotubes had on T cell production. They found that the antigens, when presented on the surface of the nanotubes, stimulated T cell response far more effectively than coating other substrates such as polystyrene in the antigens, even though the total amount of antigens used remained the same. Now they have discovered the reason behind the increased stimulation. They found that the antigens cluster in high concentrations around the tiny defects found in the carbon nanotubes. Current adoptive immunotherapy takes weeks to produce enough T cells, but lab tests showed that the nanotubes produced the same T cell concentration in just one-third the time, Fahmy said. Carbon nanotubes can cause problems, such as an embolism, when used in the body. But this isn’t the case when they are used in blood that has been extracted from the patient, Fahmy said. Next, the team will work on a way to effectively remove the carbon nanotubes from the blood before it is returned to the patient. Other authors of the paper include lead author Tarek Fadel, Michael Look, Peter Staffier, Gary Haller and Lisa Pfefferle, all of the Yale School of Engineering & Applied Science. 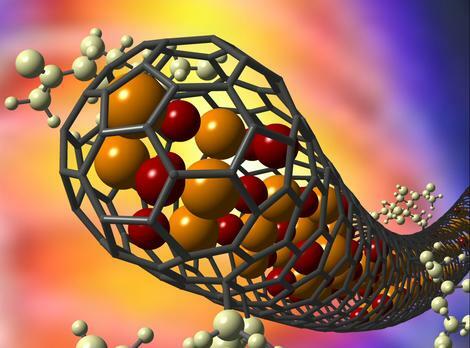 New research on how carbon nanotubes may be used in medical applications. [PRESS RELEASE, 5 April 2010] A team of Swedish and American scientists has shown for the first time that carbon nanotubes can be broken down by an enzyme – myeloperoxidase (MPO) – found in white blood cells. Their discoveries are presented in Nature Nanotechnology and contradict what was previously believed, that carbon nanotubes are not broken down in the body or in nature. The scientists hope that this new understanding of how MPO converts carbon nanotubes into water and carbon dioxide can be of significance to medicine. Carbon nanotubes are a material consisting of a single layer of carbon atoms rolled into a tube with a diameter of only a couple of nanometres (1 nanometer = 1 billionth of a metre) and a length that can range from tens of nanometres up to several micrometers. Carbon nanotubes are lighter and stronger than steel, and have exceptional heat-conductive and electrical properties. They are manufactured on an industrial scale, mainly for engineering purposes but also for some consumer products. Carbon nanotubes were once considered biopersistent in that they did not break down in body tissue or in nature. In recent years, research has shown that laboratory animals exposed to carbon nanotubes via inhalation or through injection into the abdominal cavity develop severe inflammation. This and the tissue changes (fibrosis) that exposure causes lead to impaired lung function and perhaps even to cancer. For example, a year or two ago, alarming reports by other scientists suggested that carbon nanotubes are very similar to asbestos fibres, which are themselves biopersistent and which can cause lung cancer (mesothelioma) in humans a considerable time after exposure. This current study thus represents a breakthrough in nanotechnology and nanotoxicology, since it clearly shows that endogenous MPO can break down carbon nanotubes. This enzyme is expressed in certain types of white blood cell (neutrophils), which use it to neutralise harmful bacteria. Now, however, the researchers have found that the enzyme also works on carbon nanotubes, breaking them down into water and carbon dioxide. The researchers also showed that carbon nanotubes that have been broken down by MPO no longer give rise to inflammation in mice. The study was led by researchers at Karolinska Institutet, the University of Pittsburgh and the National Institute for Occupational Safety and Health (NIOSH), and was financed in part through grants from the National Institutes of Health (NIH) and the Seventh Framework Programme of the European Commission. The work was conducted as part of the NANOMMUNE project, which is coordinated by associate professor Bengt Fadeel of the Institute of Environmental Medicine, Karolinska Institutet, and which comprises a total of thirteen research groups in Europe and the USA. … research has determined a bacterial byproduct that was found in the soil of Easter Island provides longevity in mice, and two separate studies showed reversal of Alzheimer’s symptoms. Pretty amazing discovery. A study published yesterday in the Journal of Biological Chemistry confirmed that mice with Altzheimers showed marked improvement in memory and cognition after being fed a rapamycin-enhanced diet. This study was released simultaneously with another, in PLoS One, which confirmed the results of the first in a different group of mice. Rapamycin has already been approved by the FDA to treat organ rejection in transplant patients. That means doctors could start prescribing it for the “off label” use of treating Alzheimers tomorrow. The researchers are still not sure if the drug would reverse the effects of Alzheimers, or simply block them. But for millions of people suffering the effects of Alzheimers, that question may be moot. Love it, hate it or maybe just sick of hearing about it, this bill will pass today. Obama essentially staked his entire presidency on health care reform this past week, so there’s no shock this thing is going to become a law. Next stop Obama’s desk, and then on to SCOTUS? GAINESVILLE, Fla. — University of Florida engineering researchers have found they can ignite certain nanoparticles using a low-power laser, a development they say opens the door to a wave of new technologies in health care, computing and automotive design. A paper about the research appears in this week’s advance online edition of Nature Nanotechnology. Vijay Krishna, Nathanael Stevens, Ben Koopman and Brij Moudgil say they used lasers not much more intense than those found in laser pointers to light up, heat or ignite manufactured carbon molecules, known as fullerenes, whose soccer-ball-like shapes had been distorted in certain ways. They said the discovery suggests a score of important new applications for these so-called “functionalized fullerenes” molecules already being developed for a broad range of industries and commercial and medical products. “The beauty of this is that it only requires a very low intensity laser,” said Moudgil, professor of materials science and engineering and director of the engineering college’s Particle Engineering Research Center, where the research was conducted. 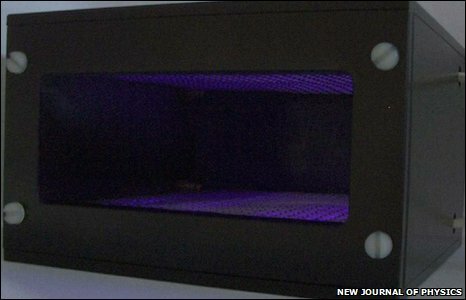 The researchers used lasers with power in the range of 500 milliwatts. Though weak by laser standards, the researchers believe the lasers have enough energy to initiate the uncoiling or unraveling of the modified or functionalized fullerenes. That process, they believe, rapidly releases the energy stored when the molecules are formed into their unusual shapes, causing light, heat or burning under different conditions. The Nature Nanotechnology paper says the researchers tested the technique in three possible applications. In the first, they infused cancer cells in a laboratory with a variety of functionalized fullerenes known to be biologically safe called polyhydroxy fullerenes. They then used the laser to heat the fullerenes, destroying the cancer cells from within. “It caused stress in the cells, and then after 10 seconds we just see the cells pop,” said Krishna, a postdoctoral associate in the Particle Engineering Research Center. He said the finding suggests doctors could dose patients with the polyhdroxy fullerenes, identify the location of cancers, then treat them using low-power lasers, leaving other tissues unharmed. Another application would be to image the locations of tumors or other areas of interest in the body using the fullerenes’ capability to light up. The paper also reports the researchers used fullerenes to ignite a small explosive charge. The weak laser contained far less energy than standard electrical explosive initiators, the researchers said, yet still ignited a type of functionalized fullerenes called carboxy fullerenes. That event in turn ignited comparatively powerful explosives used in traditional blasting caps. Mining, tunneling or demolition crews currently run electrical lines to explosives, a time-consuming and expensive process for distant explosives. The experiment suggests crews could use blasting caps armed with the fullerenes and simply point a laser to set them off. The researchers coated paper with polyhyroxy fullerenes, then used an ultrahigh resolution laser to write a miniature version of the letters “UF.” The demonstration suggests the technique could be used for many applications that require extremely minute, precise, lithography. Moudgil said the researchers had developed one promising application involving creating the intricate patterns on computer chips. Although not discussed in the paper, other potential applications include infusing the fullerenes in gasoline, then igniting them with lasers rather than traditional sparkplugs in car engines, Moudgil said. Because the process is likely to burn more of the gasoline entering the cylinders, it could make cars more efficient and less polluting. The researchers have identified more than a dozen potential applications and applied for several patents. This week’s Nature Nanotechnology paper is the first scientific publication on the discovery and the new technique. Medical nanotech news from McGill University. A team of McGill Chemistry Department researchers led by Dr. Hanadi Sleiman has achieved a major breakthrough in the development of nanotubes – tiny “magic bullets” that could one day deliver drugs to specific diseased cells. Sleiman explains that the research involves taking DNA out of its biological context. So rather than being used as the genetic code for life, it becomes a kind of building block for tiny nanometre-scale objects. Until now, DNA nanotubes could only be constructed by rolling a two-dimensional sheet of DNA into a cylinder. Sleiman’s method allows nanotubes of any shape to be formed and they can either be closed to hold materials or porous to release them. Materials such as drugs could then be released when a particular molecule is present. One of the possible future applications for this discovery is cancer treatment. However, Sleiman cautions, “we are still far from being able to treat diseases using this technology; this is only a step in that direction. Researchers need to learn how to take these DNA nanostructures, such as the nanotubes here, and bring them back to biology to solve problems in nanomedicine, from drug delivery, to tissue engineering to sensors,” she said. The team’s discovery was published on March 14, 2010 in Nature Chemistry. The research was made possible with funding from the National Science and Engineering Research Council and the Canadian Institute for Advanced Research. Nanotechnology is proving to have many medical applications, and the bulk of those apps are in cancer research. Here’s the latest from Cornell. ITHACA, N.Y. – Another weapon in the arsenal against cancer: Nanoparticles that identify, target and kill specific cancer cells while leaving healthy cells alone. Led by Carl Batt, the Liberty Hyde Bailey Professor of Food Science, the researchers synthesized nanoparticles – shaped something like a dumbbell – made of gold sandwiched between two pieces of iron oxide. They then attached antibodies, which target a molecule found only in colorectal cancer cells, to the particles. Once bound, the nanoparticles are engulfed by the cancer cells. To kill the cells, the researchers use a near-infrared laser, which is a wavelength that doesn’t harm normal tissue at the levels used, but the radiation is absorbed by the gold in the nanoparticles. This causes the cancer cells to heat up and die. The goal, said lead author and biomedical graduate student Dickson Kirui, is to improve the technology and make it suitable for testing in a human clinical trial. The researchers are now working on a similar experiment targeting prostate cancer cells. “If, down the line, you could clinically just target the cancer cells, you could then spare the health surrounding cells from being harmed – that is the critical thing,” Kirui said. Gold has potential as a material key to fighting cancer in future smart therapies. It is biocompatible, inert and relatively easy to tweak chemically. By changing the size and shape of the gold particle, Kirui and colleagues can tune them to respond to different wavelengths of energy. Once taken up by the researchers’ gold particles, the cancer cells are destroyed by heat – just a few degrees above normal body temperature – while the surrounding tissue is left unharmed. Such a low-power laser does not have any effect on surrounding cells because that particular wavelength does not heat up cells if they are not loaded up with nanoparticles, the researchers explained. Using iron oxide – which is basically rust – as the other parts of the particles might one day allow scientists to also track the progress of cancer treatments using magnetic resonance imaging, Kirui said, by taking advantage of the particles’ magnetic properties. The research was funded by the Sloan Foundation and the Ludwig Institute for Cancer Research, which has been a partner with Cornell since 1999 to bring laboratory work to clinical testing. The research is reported in the Feb. 15 online edition of the journal Nanotechnology. This study fits in with “wearable electronics” concept. For wearable electronics to be effective you need comfortably wearable juice to power those devices. Looks like some interesting medical applications here as well. IMAGE: “Piezo-rubber, ” super-thin films that harvest energy from motion, could be worn on the body or implanted to power cell phones, heart pacemakers, and other electronics in the future. Scientists are reporting an advance toward scavenging energy from walking, breathing, and other natural body movements to power electronic devices like cell phones and heart pacemakers. In a study in ACS’ monthly journal, Nano Letters, they describe development of flexible, biocompatible rubber films for use in implantable or wearable energy harvesting systems. The material could be used, for instance, to harvest energy from the motion of the lungs during breathing and use it to run pacemakers without the need for batteries that must be surgically replaced every few years. Michael McAlpine and colleagues point out that popular hand-held consumer electronic devices are using smaller and smaller amounts of electricity. That opens the possibility of supplementing battery power with electricity harvested from body movements. So-called “piezoelectric” materials are the obvious candidates, since they generate electricity when flexed or subjected to pressure. However, manufacturing piezoelectric materials requires temperatures of more than 1,000 degrees F., making it difficult to combine them with rubber. The scientists describe a new manufacturing method that solves this problem. It enabled them to apply nano-sized ribbons of lead zirconate titanate (PZT) — each strand about 1/50,000th the width of a human hair — to ribbons of flexible silicone rubber. PZT is one of the most efficient piezoelectric materials developed to date and can convert 80 percent of mechanical energy into electricity. The combination resulted in a super-thin film they call ‘piezo-rubber’ that seems to be an excellent candidate for scavenging energy from body movements. Okay, I admit I’m running this release for the most part to run the title above (hit this link for part one), but robot-assisted surgery is an idea that will continue to gain acceptance and improve as a discipline. WINSTON-SALEM, N.C. – A comparison of two types of minimally invasive surgery to repair kidney blockages that prevent urine from draining normally to the bladder found that robot-assisted surgery was faster and resulted in less blood loss and shorter hospital stays. Reporting in the Canadian Journal of Urology, Ashok Hemal, M.D., a urologic surgeon from Wake Forest University Baptist Medical Center, compared laparoscopic and robot-assisted surgery for repairing the blockage, known as uretero-pelvic junction obstruction. Following the patients for 18 months showed that both options were equally successful, but the robot-assisted technique had several advantages. On average, robot-assisted surgery was 50 percent faster (98-minute versus 145-minute average), resulted in 60 percent less blood loss (40ml versus 101ml average), and required a two-day hospital stay, versus 3.5 days for laparoscopic surgery. All 60 patients had a procedure known as pyeloplasty that involves reconstructing the narrow area where part of the kidney meets the ureter, the tube that carries the urine from the renal pelvis into the bladder. Blockages in this area can be the result of birth defects or, in adults, from injury, previous surgery or disorders that can cause inflammation of the upper urinary tract. Previously the repair required a large incision. New technology led to minimally invasive approaches that require only small incisions — laparoscopic surgery, in which the surgeon directly manipulates a viewing device and operating instruments inserted into the abdomen, and robot-assisted surgery, in which the surgeon sits at a console and uses hand and finger movements to control centimeter-size instruments while viewing the surgical site on a screen. Various studies have reported on the results of the options, but this is one of the first studies in which a surgeon with expertise in both options compared them. Hemal treated 30 patients with laparoscopic surgery and 30 with robot-assisted surgery. Hemal’s colleagues on the report are Satyadip Mukherjee, M.D., and Kaku Singh, M.D., both with the All India Institute of Medical Sciences in New Delhi, where the surgeries were performed. Wake Forest University Baptist Medical Center (www.wfubmc.edu) is an academic health system comprised of North Carolina Baptist Hospital, Brenner Children’s Hospital, Wake Forest University Physicians, and Wake Forest University Health Sciences, which operates the university’s School of Medicine and Piedmont Triad Research Park. The system comprises 1,154 acute care, rehabilitation and long-term care beds and has been ranked as one of “America’s Best Hospitals” by U.S. News & World Report since 1993. Wake Forest Baptist is ranked 32nd in the nation by America’s Top Doctors for the number of its doctors considered best by their peers. The institution ranks in the top third in funding by the National Institutes of Health and fourth in the Southeast in revenues from its licensed intellectual property. … may not be all that far off. The release doesn’t get into any sort of time-to-market predictions, but if this becomes reality it will be one amazing medical breakthrough. COLUMBIA, Mo. – What if it were possible to go to the store and buy a kit to quickly and accurately diagnose cancer, similar to a pregnancy test? A University of Missouri researcher is developing a tiny sensor, known as an acoustic resonant sensor, that is smaller than a human hair and could test bodily fluids for a variety of diseases, including breast and prostate cancers. Kwon’s real-time, special acoustic resonant sensor uses micro/nanoelectromechanical systems (M/NEMS), which are tiny devices smaller than the diameter of a human hair, to directly detect diseases in body fluids. The sensor doesn’t require bulky data reading or analyzing equipment and can be integrated with equally small circuits, creating the potential for small stand-alone disease-screening systems. Kwon’s sensor also produces rapid, almost immediate results that could reduce patient anxiety often felt after waiting for other detection methods, such as biopsies, which can take several days or weeks before results are known. Last January, Kwon was awarded a $400,000, five-year National Science Foundation CAREER Award to continue his effort on this sensor research. The CAREER award is the NSF’s most prestigious award in support of junior faculty members who exemplify the role of teacher-scholars through outstanding research, excellent teaching, and the integration of education and research. Kwon’s sensor research has been published in the IEEE International Conference on Solid-state, Sensors, Actuators and Microsystems and the IEEE Conference on Sensors. Via KurzweilAI.net — Nanotechnology continues to be a major player in treating cancer. Researchers at the National Cancer Institute’s Centers of Cancer Nanotechnology Excellence have developed a “cocktail” of two different nanometer-sized particles that work in concert within the bloodstream to locate, adhere to and kill cancerous tumors. One nanomaterial was designed to find and adhere to tumors in mice and then sensitize tumor cells for the second nanoparticle, which kills the tumors. And the form of the reform is taking shape. It’s a major issue in the U.S. and an insanely hot button topic in politics, made even more in modern politics after the defeat of Hillarycare in Clinton’s first term. I’ve stayed largely on the sidelines on heath care reform and have mostly sought as unbiased as possible ideas and opinions. I did think it was a strategic mistake for the GOP to effectively take itself out of the serious sausage-making of the bills and just throwing random poop at the walls to see what resonated as a decent attack line. I’ve finally read one piece that makes me feel quite a bit better about the legislation that will hit Obama’s desk sometime in the near future, “Testing, Testing” by Atul Gawande in the December 14, 2009, issue of the New Yorker. Gawande is a M.D. and a regular New Yorker contributor and has written on the challenges of receiving and practicing medical care in the current climate. This article is measured, doesn’t really take any of the partisan sides other than to acknowledge something has to be done to change the status quo, and lays out a vision where the current legislation could start an ongoing process of continued improvement in heath care and its administration. Whichever side of the reform debate you stand on, this article should be a priority read for a glimpse into what could be with the current legislation. It’s not going appease anyone who opposes the bill on either extreme, but it should make anyone who reads the article feel a bit better about the future of medicine in the United States. In the article Gawande lays out parallels between the agriculture reform efforts of the twentieth century and the current effort at health care reform. Getting our medical communities, town by town, to improve care and control costs isn’t a task that we’ve asked government to take on before. But we have no choice. At this point, we can’t afford any illusions: the system won’t fix itself, and there’s no piece of legislation that will have all the answers, either. The task will require dedicated and talented people in government agencies and in communities who recognize that the country’s future depends on their sidestepping the ideological battles, encouraging local change, and following the results. But if we’re willing to accept an arduous, messy, and continuous process we can come to grips with a problem even of this immensity. We’ve done it before. Via KurzweilAI.net — This is good news for a serious medical concern. A prototype device that uses “cold atmospheric plasma” to rid hands, feet, or even underarms of bacteria, including the hospital superbug MRSA, has been developed by Max Planck Institute for Extraterrestrial Physics researchers. The team says that an exposure to the plasma of only about 12 seconds reduces the incidence of bacteria, viruses, and fungi on hands by a factor of a million, a number that stands in sharp contrast to the several minutes hospital staff can take to wash using traditional soap and water. Nanoscale magnetic discs actually physically wreck cancer cells. Nanotech is offering a lot of medical treatments, particularly in cancer research. Via KurzweilAI.net — This is a concept that combines a lot of elements — excitement, concern, fear, hope and quite a bit of creepy. Advances in robotics could revolutionize healthcare, pushing the limits of what surgeons can achieve, from worm-inspired capsules to crawl through your gut, and systems swallowed in pieces that assemble themselves inside the body, to surgical robots that will soon be ready to embark on a fantastic voyage through our bodies, homing in on the part that’s ailing and fixing it from the inside. Via KurzweilAI.net — This may prove to be a major medical breakthrough once some practical applications get into actual practice and spur on additional innovation. Fully biodegradable organic transistors have been fabricated by researchers at Stanford University. They could be used to control temporary medical implants placed in the body during surgery, and help monitor the healing process from inside the body. And if the GOP is honestly against it I really wonder why the party took itself out of the sausage-making from day one. U.S. House leaders today plan to unveil legislation that would create a government-run health- insurance program, require employers to offer coverage to their workers and impose a new tax on the wealthiest Americans. The legislation comes after three months of negotiations by House Democrats and represents the most sweeping changes to the nation’s health-care system since the 1965 creation of the federal Medicare program for the elderly. The measure would overhaul the insurance market, encourage greater use of preventive medicine and help Americans buy coverage. “We think we’ll have the votes,” said California Representative George Miller, who runs the House Education and Labor Committee, after meeting with fellow Democrats yesterday. Formal debate is planned for next week, Miller said. Lawmakers said House Speaker Nancy Pelosi agreed to a compromise over one of the most divisive issues facing Congress — the establishment of the government insurance program to compete with private insurers try to and drive down costs. Via KurzweilAI.net — Looks like this nanotech has applications in communications, medicine and alternative power, to name three. Gold nanoantennas smaller than 100 nm that transmit and receive light have been developed by Karlsruhe Institute of Technology researchers. The antennas could be used in new optical high-speed data networks and in chip manufacturing and photovoltaic devices, and for the study of individual biomolecules.